Sound design is not about software, catchy music or cool sounding effects. It’s about emotional response: how a combination of dialogue, music, sound effects, designed sounds and backgrounds supports character development and the dramatic elements of the story. Why do certain sounds make us feel uneasy, scared, happy or sad? How do you determine what sounds will support your story and scenes? How do you decide if a particular character or prop should have a “signature” sound? When should you use music and when to use silence? Where can you get or create the sounds you hear in your imagination, and how do you combine or manipulate them for maximum effect? This workshop will explore how powerful sound can be by looking deeply at different artistic choices and their influences the meaning of a scene. The different stages and workflow of sound design will be discussed in detail, from reading the script, to reviewing the rough cut and the final mix. 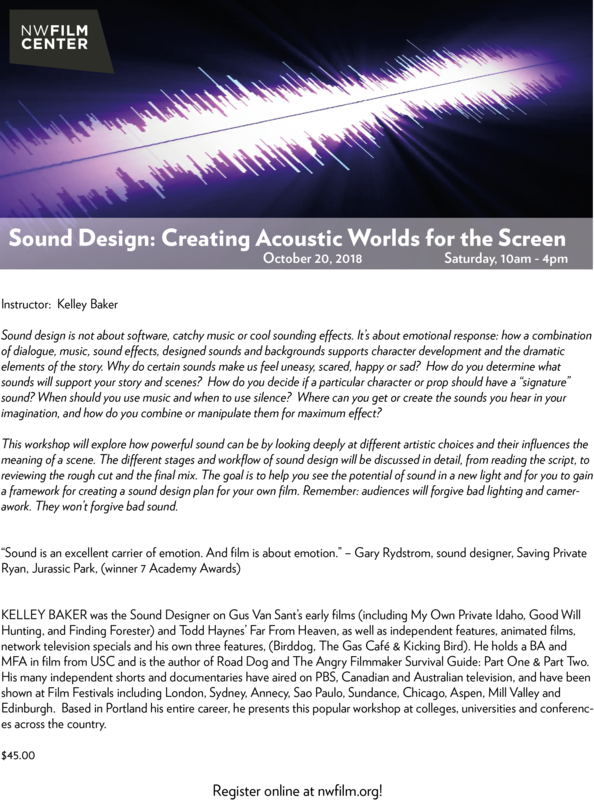 The goal is to help you see the potential of sound in a new light and for you to gain a framework for creating a sound design plan for your own film. Remember: audiences will forgive bad lighting and camerawork. They won’t forgive bad sound.